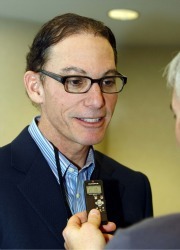 Colts considering CFL’s Marc Trestman? When a team finds itself without a coach, there is a group of names that come up over and over to be interviewed. A new one may have entered the club. ESPN reports that there is an "outside chance" that the 2-14 Indianapolis Colts, who just fired coach Jim Caldwell, will interview Marc Trestman, who is a graduate of the University of Miami's law school and was considered for his alma mater's top coaching spot back in 2010. According to allcoachesnetwork.com, Trestman worked for the Hurricanes from 1981 until 1985 when he signed on with the Minnesota Vikings. Four years later, he became the offensive coordinator with the Cleveland Browns. He's also spent time with the San Francisco 49ers, Detroit Lions, Arizona Cardinals and Oakland Raiders. Trestman is in his final year as coach of the CFL's Montreal Alouettes, according to the Montreal Gazette. Other folks likely on the list for the Colts, ESPN notes, are Philadelphia Eagles offensive coordinator Marty Mornhinweg and Denver Broncos offensive coordinator Mike McCoy. Find out before your friends. Follow Scoop du Jour on Twitter or Facebook.